Political succession is a key issue in the contemporary Middle East. In this new study the author examines the process and shows how respect for those in authority and tribal codes of loyalty have been far more influential in maintaining regimes than security institutions and political repression. The Arab world is faced by political turmoil and demands for reform. Many of the problems of the region are attributed to the form of leadership that dominates the area, leadership that is authoritarian and focused on regime survival rather than political change. The book highlights the ways in which family loyalties pervade political, economic and social life and how constitutions are being used to consolidate the power of ruling families in republics and monarchies. The volume explores the notion that the region’s rulers, monarchic and republican, are inclined to pass their power on to their sons, and evaluates the use they make of family and tribal networks to maintain their power. The work sees to demonstrate that despite economic and social problems, Arabs value stability and prefer an authoritarian family-based regime than government run by Islamist groups. 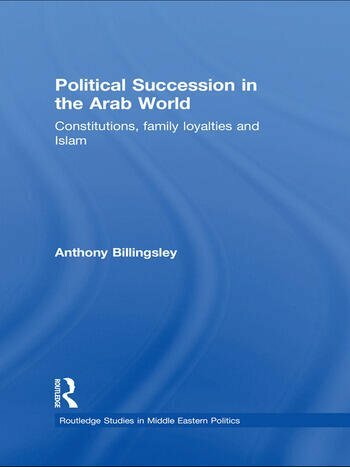 Providing new insights into the influences on political succession in the Middle East, this work will be of great interests to scholars of Middle East studies, history and international relations. Anthony Billingsley is a lecturer at the University of New South Wales in Australia, having spent many years in the diplomatic and intelligence areas. His areas of interest include the politics of the Middle East, especially the Gulf region, as well as international and constitutional law.